Buying a new boiler tends to be a decision that most people need to make in a hurry. Usually, your old boiler has broken down, it’s the depths of winter and you need to get your hot water and central heating restored to its former working glory. Unfortunately, buying a new boiler and getting it installed can be a bit of a minefield of big decisions. Choose an unreliable boiler or make the wrong decision about part of the installation, and it’s a mistake you and your bank balance will later regret. What to ask the heating engineer to get the best boiler installation When you talk to the heating engineer about your hot water needs, we think a good installer will mention some or all of the following for you to consider. If they don’t come up in conversation, ask about them. A good installer will be able to give you a full understanding of the benefits of each extra and advise whether they are necessary. Not all these extras will be necessary for many installations. The cost, which will vary by property, will need to be weighed up against the benefit of having each of them done. However, extras such as a system flush and a water filter are likely to be good for the ongoing health of your boiler and prolong its lifespan. Choosing the right company to install your gas boiler is probably the biggest part of any decision. Some installers are tied down to one boiler manufacture and may not offer you the best advise, quoting for a boiler that’s not suited for your properly or your needs. 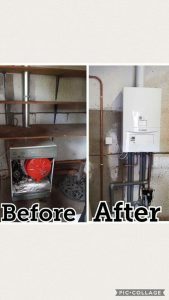 We believe at Gas Safe you should get at least 3 quotes and take advise from different companies before researching boiler manufactures and the companies you are considering to install the boiler. Google, Trusted trader, Facebook and many more companies record reviews from previous customers. This is a good way of eliminating the odd rouge trader and unreliable gas fitter. Here at gas safe we are Worcester and Vaillant accredited, this means we can offer the extended warranties on any of their boilers. We are also able to fit cheaper boilers so can cater for all budgets. Our review ratings are all excellent and second to none in the Bristol area.